Bere Island Projects Group CLG What’s new? 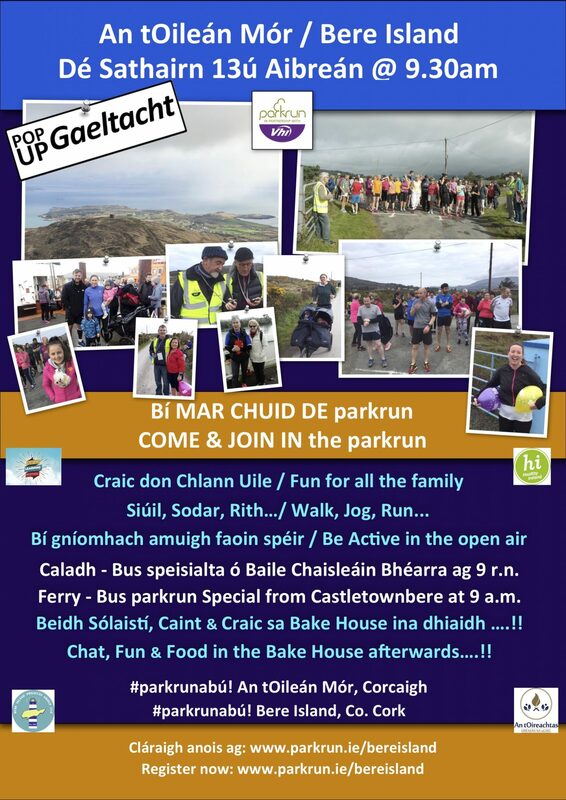 Bere Island Projects Group and Bere Island parkrun are hosting a Pop Up Gaeltacht day on Saturday 13th April starting with the parkrun as Gaeilge. Come along for the day and have a cupán tae and enjoy a cúpla focal with islanders and fellow visitors! The Minister for Housing, Planning and Local Government Eoghan Murphy TD visited Bere Island on Saturday 30th March. 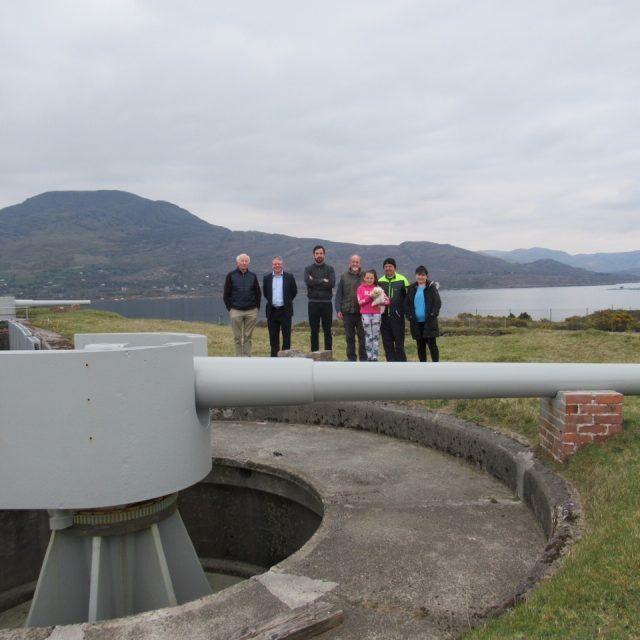 Members of Bere Island Projects Group and the Lonehort Steering Group gave the minister a tour of Lonehort Battery and outlined their plans for developing the Battery as a visitor attraction. 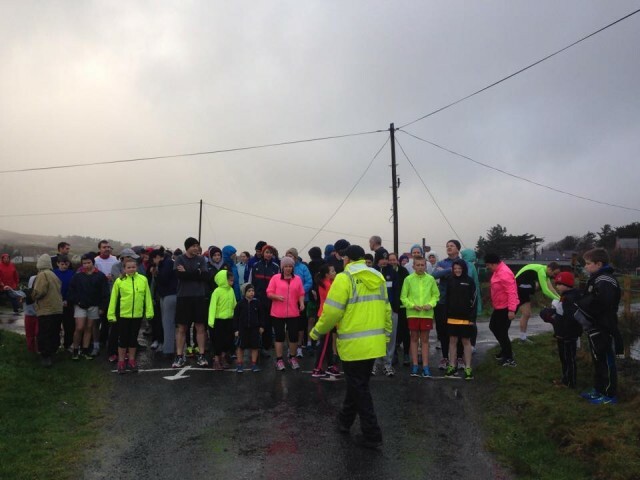 Minister Murphy also took part in the Bere Island parkrun. As a mark of respect to the family of the late John McCarthy (RIP) the launch of Bere Island Community Radio will not now take place on Sunday March 17th. We offer sincere sympathy to John’s family. Ar dheis Dé go raibh a hanam. For funeral details click here. As a mark of respect to the family of the late Mary Walsh (RIP), mother of our colleague John Walsh, BIPG office will be closed on Tuesday 5th March and will reopen on Wednesday 6th March at 9AM. Funeral arrangements are available here. Ar dheis Dé go raibh a hanam. Bere Island Projects Group were delighted to host a partners meeting on the island last week for the Grassroots Wavelengths Community Radio projects. 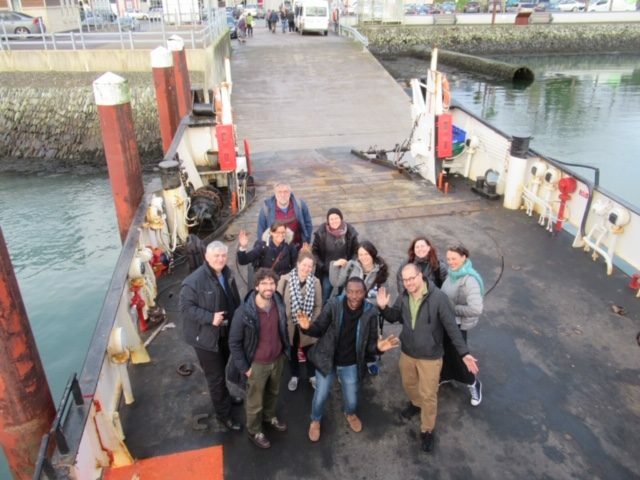 Twenty members of the project from Romania, Madeira, Belgium and UCC enjoyed a three day conference on Bere Island. Thank you to all the accommodation providers, restaurants, ferry operators, tour guide and bus drivers who facilitated this visit. The group throoughouly enjoyed their stay here. 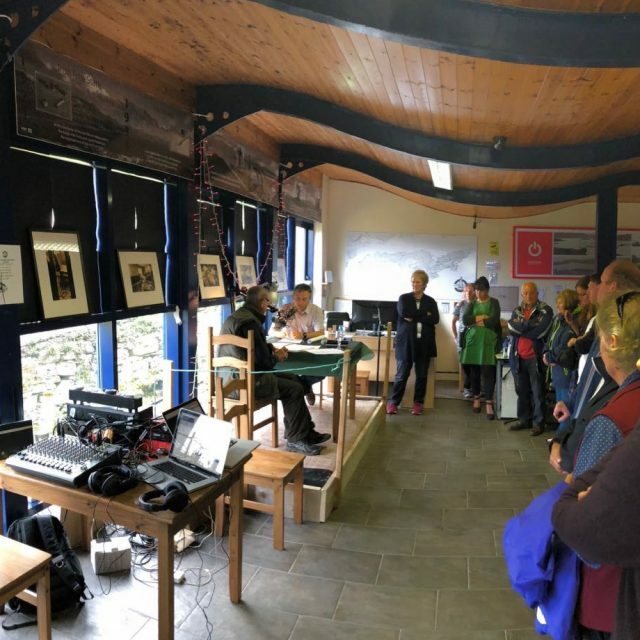 BIPG have recently been awarded a temporary broadcasting licence from the Broadcast Authority of Ireland and plan to start broadcasting Bere Island Community Radio on the FM airwaves and online in the near future. 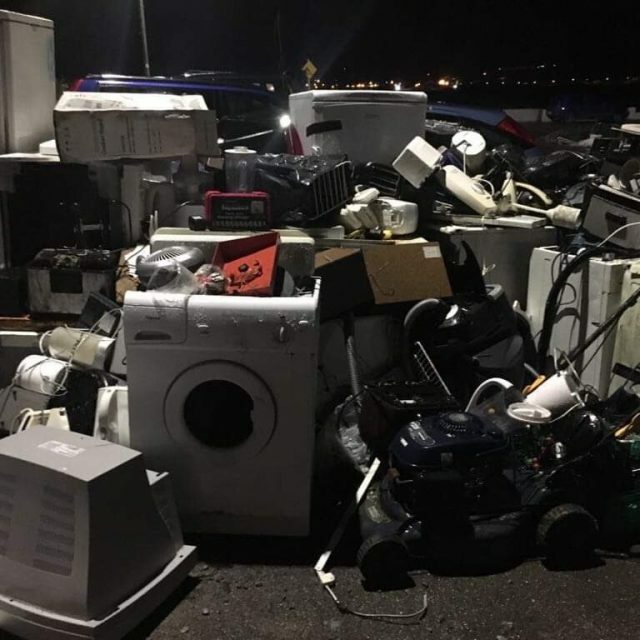 Bere Island Projects Group together with Cork County Council organised a collection of used electrical goods from the island. Thanks also to the staff at the recycling centre for facilitating the collection. Bere Island Projects Group look forward to hosting all the partners from the EU Grassroots Community Radio Project on the island next week. Community organisations from Romania, Portugal, Madeira along with representatives from UCC will be on the island from 22nd-25th January. A number of events are being held while they are here and will be advertised locally. Bere Island Projects Group would like to wish everyone a very Happy New Year, and are looking forward to lots of exciting events and initiatives taking place on Bere Island in 2019. Bere Island Projects Group CLG office will close on Friday 21st December 2018 and will reopen on Monday 7th January. We would like to take this opportunity to wish everyone a very Happy Christmas and Best Wishes for 2019. Hot off the press! The Bere Island Christmas Newsletter 2018 is now on sale from Murphy’s Shop Rerrin, and SuperValu Castletownbere. Priced €5. Bere Island Projects Group would like to thank everyone who sent in contributions to the newsletter. Don’t forget, if you’re travelling overseas in the coming year take a photo of you with the newsletter and we’ll publish it in next year’s edition. 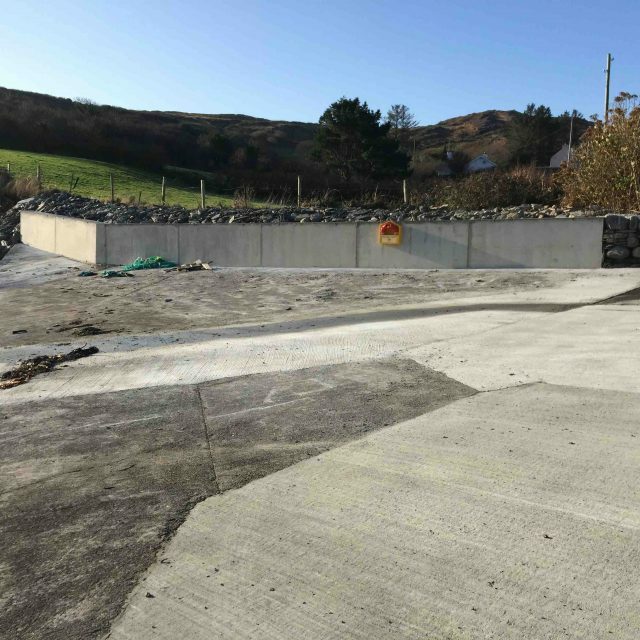 Bere Island Projects Group are delighted to announce that remedial work has now been completed at Cloughland Strand by Cork County Council. This is a vital amenity for the island, and we are grateful to their help in carrying out the work. Bere Island Projects Group will shortly be renovating the kitchen in the community centre. The old kitchen units are for sale. To put in a bid for them please contact x75099 with your offer by this Friday 23rd November. 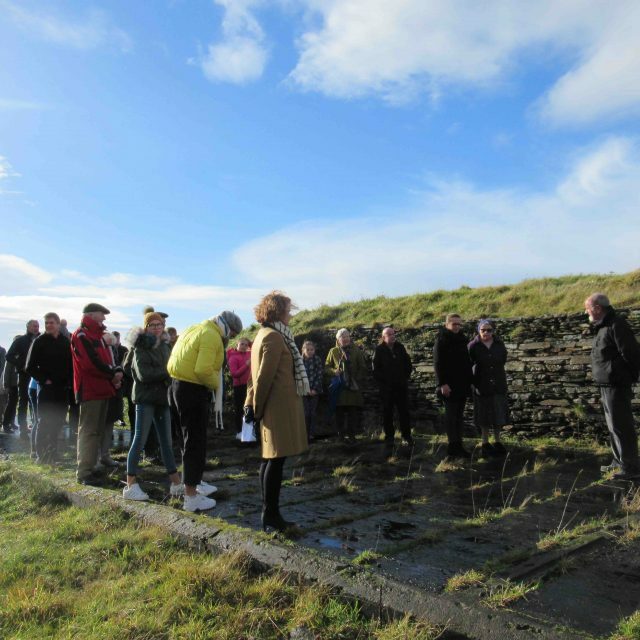 On Sunday 11th November, Bere Island Projects Group held an event at Lonehort Battery to launch Phase 1 of the redevelopment of the Battery as a visitor attraction and to mark the centenary of the end of the Great War. Island artist Mary Sullivan, who was recently awarded the RDS Taylor Art Award, performed the opening ceremony. Bere Island historian Barry Hanley gave a talk on Bere Island’s links to the Great War, and of the islanders who fought and died. Earlier that day, 14 roses were placed in front of the altar at St Michael’s Church in memory of the Irish and British soldiers buried in war graves in the adjoining cemetery. 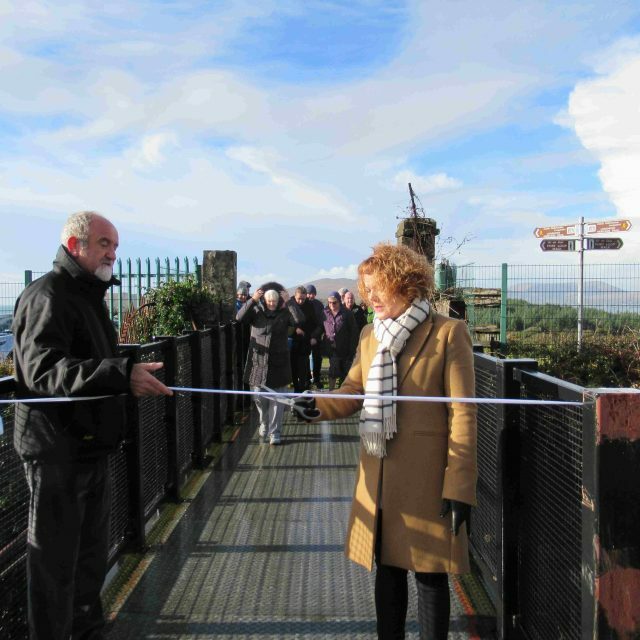 Mary Sullivan launching Phase 1 of the redevelopment of Lonehort Battery. Thank you all for coming here today. I am so honoured to be here today to mark Armistice Day, and the completion of phase one of the redevelopment works at Lonehort Battery. Thank you to the Projects Group for inviting me to launch phase one of the project, which you have all worked so tirelessly on. This event marks the centenary of the end of the Great War, which often brings to mind a poem by Thomas Kettle entitled “To My Dear Betty, The Gift of God to her.” It is in part, an explanation for his reason for taking part in the war. And so on this armistice day, we mark the armistice formed between the allies of World War 1 and Germany for the cessation of hostilities on the Western Front. We are lucky today to live in a country free from war and protected by the European Union, and so this commemoration is somewhat bitter sweet. I am so fortunate to live on an island with such a deep military heritage, which both informs and inspires my work, and so I am excited for all of you here today to in turn seek inspiration from this event, and the following talk and tour by historian Barry Hanley. During the course of my studies, I was lucky to have our very own Barry Hanley to explain to me the island’s deep heritage, for which I am very grateful. Once again, thank you to Bere Island Projects Group for inviting me to launch phase one of this project, and to all my fellow islanders who continue to support me as a friend, as an artist, and as a neighbour. Bere Island Projects Group will hold an event to mark the centenary of the end of the Great War on Sunday 11th November at 11am at Lonehort Battery, Bere Island. 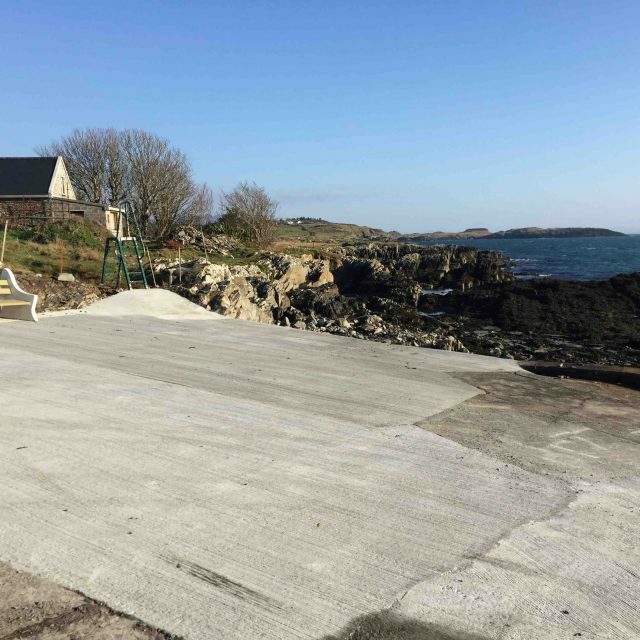 The event will commemorate Armistice Day and the completion of phase one of the redevelopment works at Lonehort Battery by Bere Island Projects Group. Island based artist Mary K Sullivan, recipient of the RDS Taylor Art Award, will launch phase one of the project. This will be followed by a talk and guided tour by island historian Barry Hanley. All are welcome to attend. Bere Island Projects Group were delighted to host the launch of the Bere Island Photographic Book project on Saturday 20th October at the Heritage Centre. The project which was supported by Cork County Council’s Creative Community Award, saw Cork based photographer Ed Godsell spend a fortnight on the island in May of this year, getting to know the island and it’s people. At the end of the fortnight, Ed set up a photographic studio in the local community centre and over the course of a weekend, islanders ranging in age from just under 2 years to mid 80s years, came along to sit for their photograph, and provide brief biographical details. Cllr Danny Collins, deputising for the Mayor of Cork County launched the book. Ian MacDonagh, Arts Officer for Cork County Council was also in attendance. 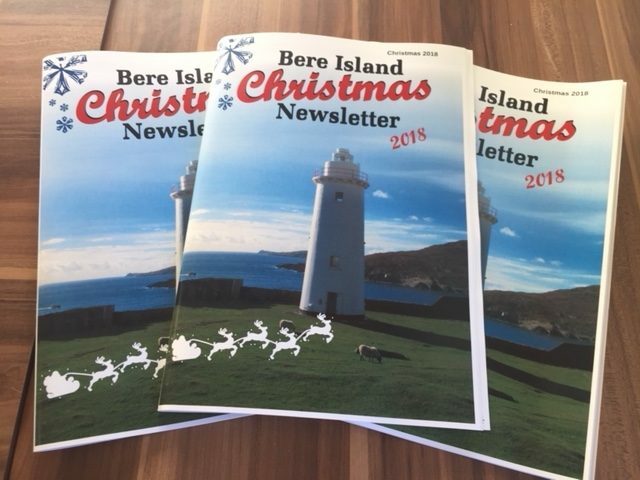 Bere Island Projects Group will once again be publishing the annual Christmas Newsletter for 2018. News of engagements, weddings, birthday, anniversaries, graduations, special birthdays etc are all welcome. We are also looking for stories of Christmases on Bere Island in days gone-by and stores on island life in general. The deadline for all items is Friday 19th October. Items can be emailed to Helen at bereconservation@gmail.com or dropped into the Projects Group Office. Bere Island Projects Group are once again hosting an event for the Taste of West Cork Festival 2018 – “Bere Island and the Great Famine.” The tour on Wednesday 12th September is now fully booked, however there are places remaining for the tour on Saturday 15th September. To book contact 027 75099. 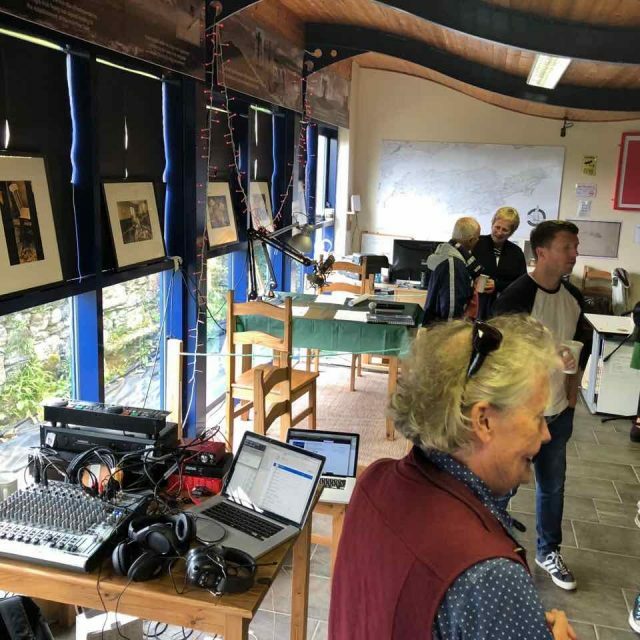 Bere Island Projects Group were delighted to hold the launch of Bere Island Community Radio last Friday 24th August in the Heritage Centre. 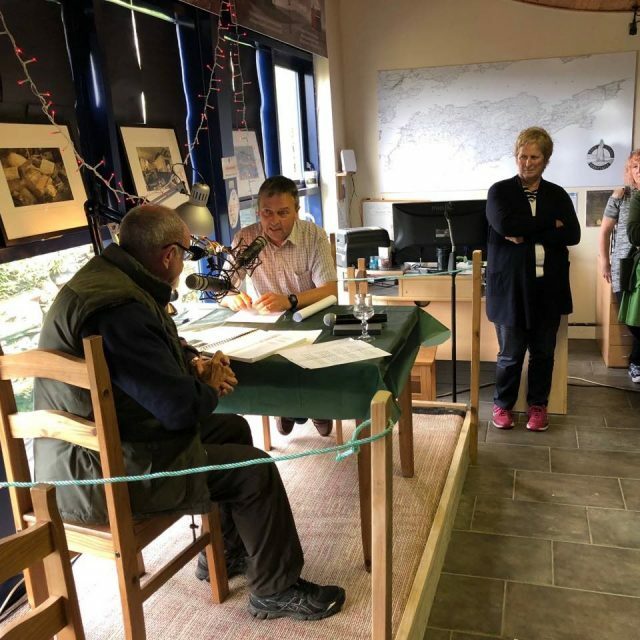 We broadcast for over an hour and half, Eugene Glendon Chair of BIPG welcomed everyone, John Walsh, Project Officer introduced the whole Project, and then we had local historian Ted Sullivan give some idea of where Bere Island is and some of its wonderful history. John also interviewed Conor and Laura from UCC about the Grassroots Project which is behind this radio initiative, followed by two “phone-ins”, one with the CRAOL Trainer, Darragh Parker from Youghal Community Radio who is coming this week for two day training sessions. Darragh talked about his experience over the last 35 years of Community Radio and what he will be covering in the 2 days training on Bere Island. The other phone-in was from Jim Hanley with regard to the upcoming GAA football all-island championships to be held on Bere Island in early September. Helen Riddell then gave a report on things that had happened over the summer on the Island and especially Heritage Week (of which this event was a part) and things to come. Brenda Elphick, who has lived all her life on the island, told of her choir, who were travelling up to Dublin to sing at the Papal Mass in the Phoenix Park in Dublin. Eugene and John then closed the chat for the day, and this was followed by two young islanders, Amy Orpen and Molly Sullivan, who played their song playlist over the air for another half hour or so. So all in all in total, we were over and hour and half “on air”. and the next broadcast will hopefully take place during the All Islands Football Tournament on 7th/8thSeptember. If anyone is interested in getting involved in Bere Island Community Radio Station contact 027 75099. Bere Island Projects Group is looking to hire a driver for the Bere Island rural transport bus from 1stOctober 2018. The bus operates on Tuesdays and Fridays to bring islanders to and from Castletownbere and on Sundays to bring islanders to and from Mass. Candidates should have a D1 licence, a CPC card and a Taco-graph card. For further details contact BIPG on 027 75099. 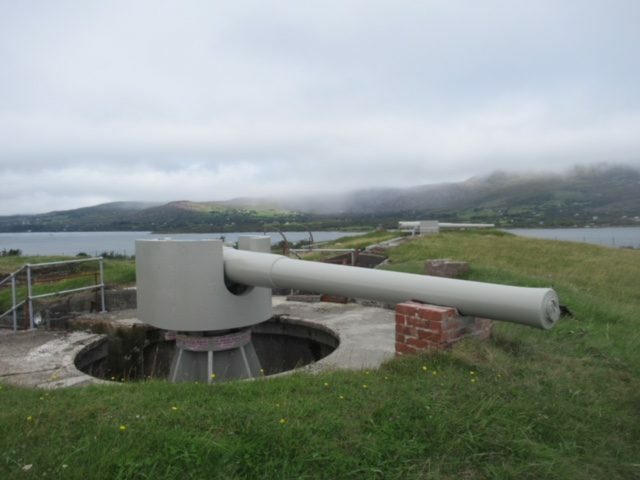 Bere Island Projects Group’s plans to restore and open Lonehort Battery as a visitor attraction are now well underway. The two 6″ artillery guns at the Battery have now been sandblasted and repainted, and essential safety work is ongoing. Watch this space for further updates! 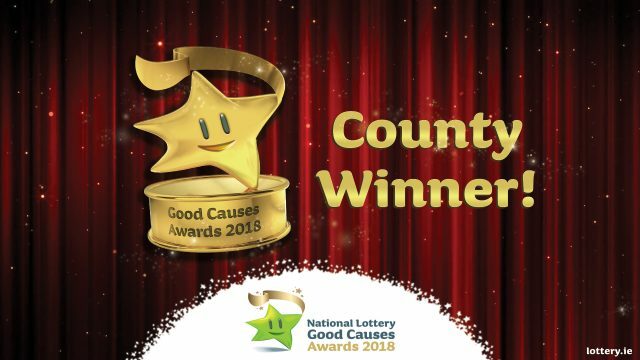 Bere Island Projects Group and the work they have carried out under the Conservation Plan have been announced as a county winner of the National Lottery Good Causes Awards 2018. BIPG now go forward to the Regional Final in September so fingers crossed! Bere Island Projects Group are delighted to be part of a new EU funded project which will see a community radio station set up on Bere Island. Broadcasts will include heritage programming, music, current affairs, public information, and community news. The station will go live in December, but check our events page for further updates on training and information sessions. Bere Island Projects Group were delighted to host the judges from the Pride of Place Awards today and Mayor of Cork County Cllr Parick Gerard Murphy at an event at the Bere Island Heritage Centre. 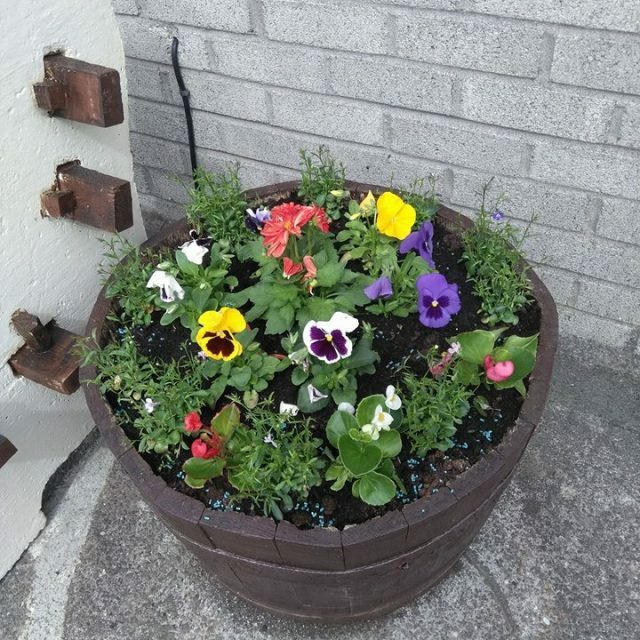 The West Cork Islands as a group, have been nominated for this year’s Pride of Place Awards. Representatives from Bere Island, Sherkin Island and Dursey Island were also in attendance. The winners will be announced on 17th November. REPORT ON MEETING OF THE COMMUNITY GROUP WITH THE HSE CONCERNING THE NURSING REQUIREMENTS ON BERE ISLAND. 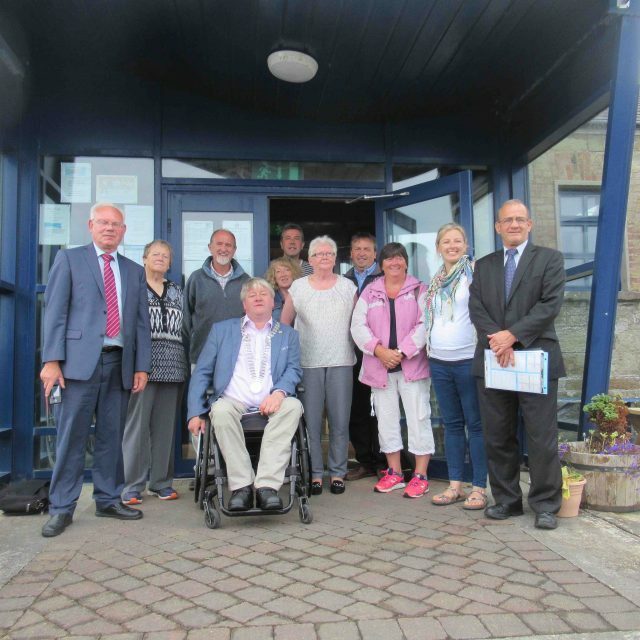 “To discuss recent changes in, and the future provision of, health services on Bere Island”. The HSE explained that the provision of nursing care on the island was funded as part of the Primary Care Team and that the HSE has to manage within their own funding resources. The Group explained at length and very forcefully that the Community on the island was extremely unhappy with health cover provided by the HSE to the island and what we now sought was the same level of cover as we had in 2009 and as now provided by the HSE to Cape Clear – and nothing less. The HSE explained that the draft Report on the provision of health services to the islands (which was not yet published) was suggesting a level of cover which would cost the HSE approximately €400,000 per annum. The Group explained that the total failure by the HSE to consult with community before changing the current minimum level of cover was the subject of severe personal distress and annoyance to the community. All of the arguments which were aired at the meeting of the Community on the 19th April were explained at length to the HSE and the HSE stated that they could not agree to our demands. It was emphasised and repeated to the HSE that the very survival of the island is dependent on the provision of a reasonable health service. The HSE advised that they do not have any role in the school. The Group believe that having regard to representations made by the Group and several members of the community the practice of the current nurse being rostered for duty on the mainland will (hopefully) now cease. In conclusion the Group explained that, in the absence of a commitment by the HSE to provide adequate funding and essential resources to the island, it was now the intention of the Group, on behalf of the Community, to immediately lobby and make representations to Government Ministers, TD’s, etc with a view to getting the necessary funding in place as a matter of urgency to ensure that the HSE will be obliged to provide a safe health service to the island. The fight for survival is only beginning. Bere Island Projects Group have recently submitted a planning application for a children’s playground on Bere Island. 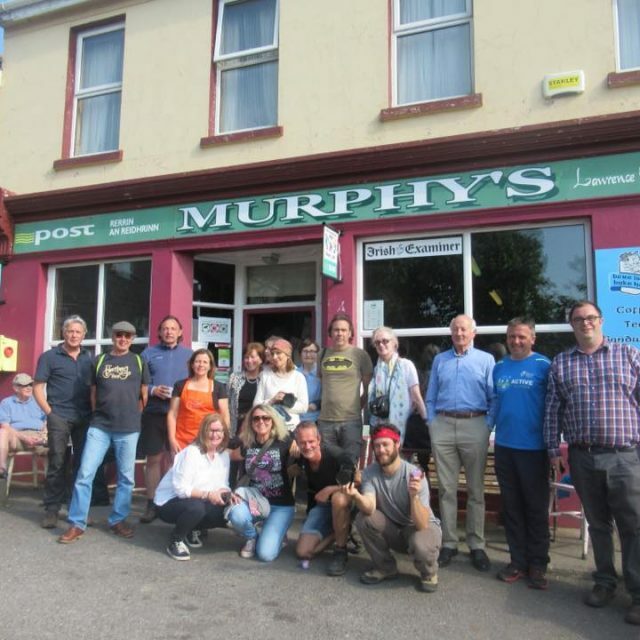 Bere Island Projects Group were delighted to host a visit from a group of international journalists who were on a tour of Cork and Kerry with Failte Ireland. The group called to the Heritage Centre, enjoyed a cycle around the parkrun route with bikes from Murphy’s Shop and had a talk on the island’s military history from Barry Hanley. They also enjoyed a demonstration on brownbread making from Edel Murphy and were presented with jars of Bere Island honey from Barry. Thanks also to Michael Walsh for driving them around the island & to Bere Island Ferries for bringing them here. A great day was had by all! 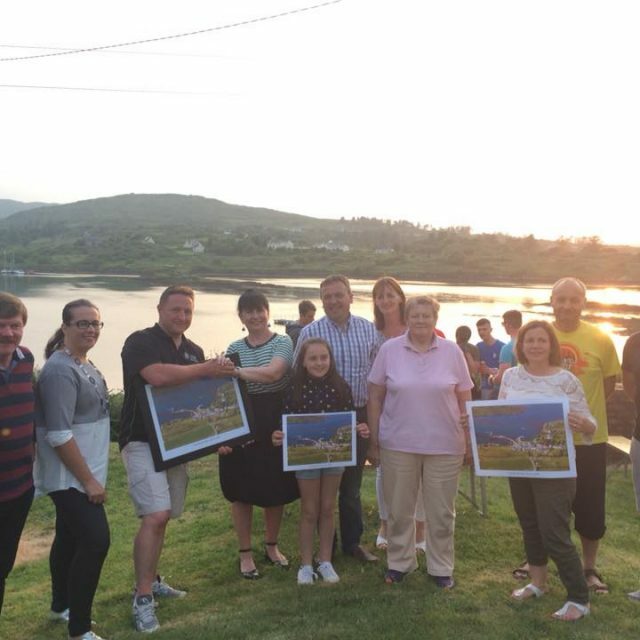 Bere Island Projects Group were delighted to be invited to a function held by the Irish Aer Corps who are on a training camp on the island and to be presented with a framed aerial photo of Rerrin Village. BIPG has a long standing relationship with the Irish Defence Forces, which includes working with them to secure a licence to restore and develop Lonehort Battery as a visitor attraction, and we are grateful to them for the use of the Lecture Theatre to stage theatrical performances during the summer months. 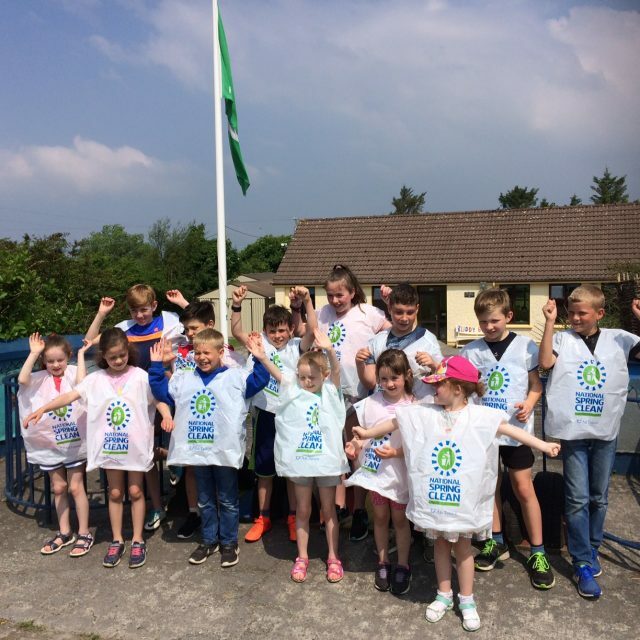 St Michael’s National school children starting their annual spring clean along the west end roads and foreshore on Bere Island organised by BIPG. The June Bank Holiday weekend is here and the island is looking great. 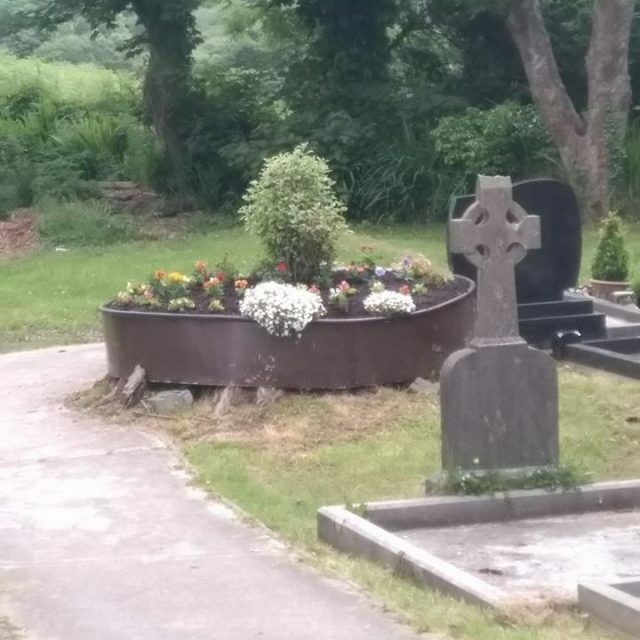 A lot of work has been carried out, the greens are strimmed, the grotto and graveyard have both been cut in preparation for the Procession on Sunday and the flowers all over the island are beautiful. Of course this wouldn’t be possible without the Fas & RSS workers Andy, Patrick, Mike and Sheila. Also Finola who does a great job with the flowers in the graveyard and anyone I’ve forgotten well done to you all. 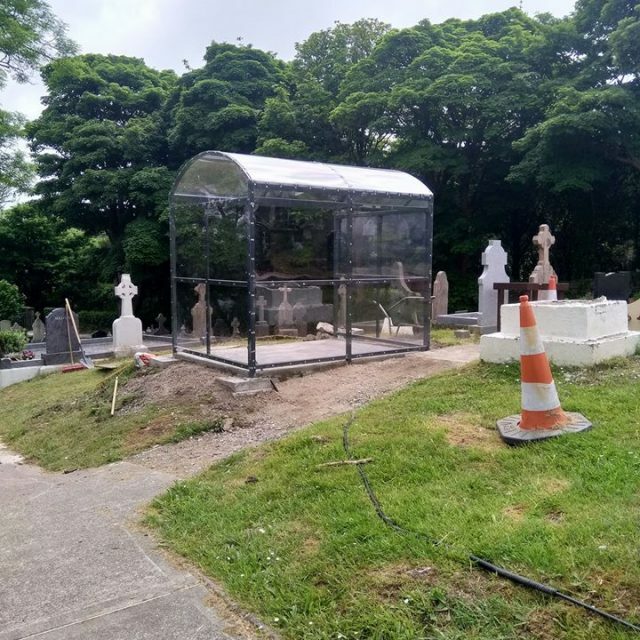 You will also see from the picture below the Graveyard Committee with the support of BIPG have erected the new shelter in the Graveyard to replace the wooden one which was damaged in the storm over the winter. The pitch is also looking well after being cut by Paul and we are ready for the Football Blitz happening tomorrow at 12:30pm in the Rec !! Best of luck to all taking part. The recycling centre is as always neat and tidy thanks to Teddy & John and the can banks are empty for the busy summer ahead. The Lookout and Bere Island Bakehouse are now open for food along with the Hotel which will have music tonight with Damien Coughlan and Dessie’s is open this evening for the weekend. All that’s left to say is we hope the weather stays nice and you enjoy the weekend and stay safe. Bere Island Projects Group CLG succeed in obtaining Heavy Cargo Subsidy for the Island. BIPG is pleased to confirm that it has been successful in obtaining a very significant heavy cargo subsidy for the island which will result in it now being cheaper to bring heavy cargo loads ( over 17 tons) into the island at a rate which is now cheaper than it was 30 years ago! The maximum charge is now €90.00 per load ( fixed for the next two years) and the service will run at a minimum of twice per week throughout the year. For further information on any of the events please contact 027 75099. Children’s Summer Camp at the GAA Pitch with sports, games and arts and crafts. The annual 5k and 10k midsummer run organised by Bere Island GAA Club. Swim Week with Irish Water Safety. Learn to swim and also life saving skills. Further details of the performance to be announced. GAA skills camp for children at the GAA Pitch. Sailing Week. See the Bere Island Watersports Club Facebook page for further updates. Bere Island Festival. A week of activities and events to suit all the family, including the Bere Island biathlon, sports day and watersports. Further details of events taking place on Bere Island to be announced shortly. Every Saturday morning at 9.30am from the GAA Pitch. Click here for further details. The Active Retirement Group hold fortnightly coffee mornings. The next coffee morning will be held on Wednesday 24th April at 11am. The group will have an outing to meet with Ardgroom Active Retirement Group on Tuesday 2nd May. Call Tim on 75099 to book a place. The parent and toddler group meet every Thursday from 10.30am to 12.30pm in the Community Centre. The After School Club is open every Monday from 3pm to 5pm in the Community Centre. Rubbish stickers are €10 and are available from Murphy’s Shop, Rerrin and the Projects Group Office. Please note, any bags which do not have a rubbish sticker will NOT be collected. Materials for recycling can be placed in the appropriate containers at the recycling centre on the west end pier. Donations towards the running of the centre are greatly appreciated and can be left in the honesty box at the centre. We thank you for your assistance in keeping our island tidy. The rural transport bus travels to Castletownbere on Tuesdays and Fridays, travelling out on the 10am ferry from the west end and returning on the 1.30pm ferry. The bus will pick you up from your home and drop you back afterwards. The bus also transports people to and from Mass on Sundays.The bus is free for holders of travel passes. If you would like to avail of the bus service please contact 027 75099. Council housing will soon become available on Bere Island. Please contact your housing officer at Cork County Council if you are interested. Bere Island parkrun is on every Saturday at 9.30am. The park run is a 5k measured course around the eastern end of the island and is open to runners, joggers and walkers. Parkruns are free 5k running events which take place every week. The run is free, although participants are encouraged to register online in order to obtain a bar code, which is scanned at the beginning and end of their run, allowing them to track their progress on a weekly basis. The parkrun was founded in 2005, with the first run taking place in Teddington, England. The idea quickly took off and there are now parkruns worldwide, with all runs organised on a voluntary basis. On any given Saturday on Bere Island, you could be running or walking alongside islanders of all ages, visitors and members of the Irish Defence Forces who have a training base on the island. Past runners of the Bere Island parkrun have included Olympic silver medalist Sonia O’Sullivan, parkrun founder Paul Sinton-Hewitt, and the Running Guru, Noel Berkeley. 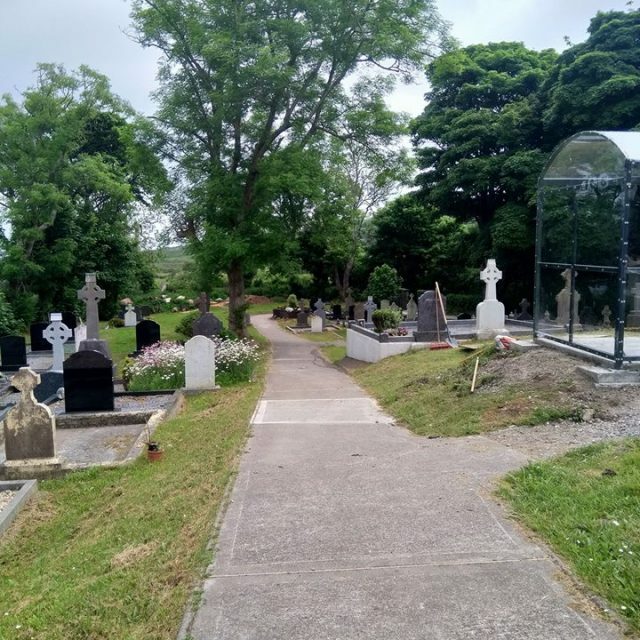 The Bere Island park run, which is on the Wild Atlantic Way offers spectacular scenery of Bantry Bay with a route which takes in a Bronze Age wedge tomb, remains of a Viking boatyard and a former World War One military battery. At the end of the run everyone heads to the Bakehouse Cafe in Rerrin Village for a coffee, scone and a chat. Or why not make a weekend of it and stay on Bere Island which has a variety of accommodation on offer. Once you have registered you will be sent a confirmation email containing your barcode and information on what to do next. You will then need to bring your barcode to the parkrun event on Bere Island, or to any of the parkrun events on offer worldwide. If you require any further information or would like to volunteer at any of the runs please email bereislandhelpers@parkrun.com.